Heat the olive oil over medium heat in a medium saucepan. Add the garlic and cook until just softened -- just a minute or two. Add the tomato paste, water, Italian seasoning, salt, pepper and sugar to the pan. Bring to a boil over medium heat, stirring occasionally. Reduce heat, cover and simmer for 10 minutes. Taste, and adjust seasoning as desired. Growing up, I could always find petite cans of tomato paste in my grandmother's cupboard. She would use it in sauces and stews. These days, you can always find a couple cans of paste in my cupboard as well. This versatile ingredient is a great go-to for fast meals. Tomato paste is a highly concentrated puree of tomatoes. It's made by cooking peeled, seeded tomatoes for several hours, thereby cooking out much of the liquid. It offers a high concentrate of tomato flavor in a thick, compact form. It can be purchased premade in cans or tubes, or made at home and frozen for future use. A good recipe can be found in Preserving Summer's Bounty. What Can Tomato Paste Be Used For? Tomato paste is a great ingredient for adding tomato flavor to a variety of dishes, from sauces to soups. It's a very thick (hence the paste in the name) and thus should be combined with water (or broth) to cook with. This loosens it into a sauce. One fabulous use for tomato paste is to use it to make a fast marinara sauce, such as my Easy, Fast Tomato Marinara. 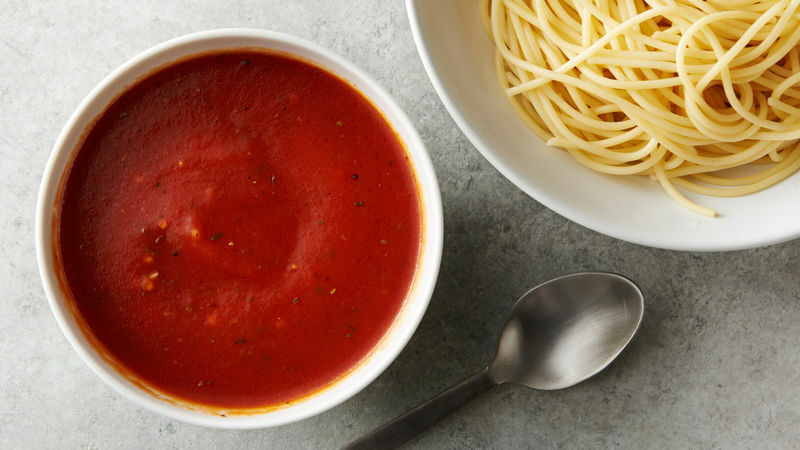 This sauce is perfect with pasta, ravioli and more. Use it on chicken parmigiana or for dipping mozzarella sticks, as well. It makes a smooth sauce, which is perferrable for some people. You can also add some chunkiness to it by combining a can of diced tomatoes (do not drain!) and a can of tomato paste in a pan with seasonings. Bring to a boil, simmer and serve. Sarah W. Caron (aka scaron is a food writer, editor and blogger who writes about family-friendly foods and raising a healthy family at Sarah's Cucina Bella.